Scotland coach Anna Signeul says Scottish women's football is in great health, with progress being made at national and domestic level. Her side are top of Euro 2017 Qualifying Group One, while Scotland will have two clubs in the Uefa Women's Champions League for the first time. 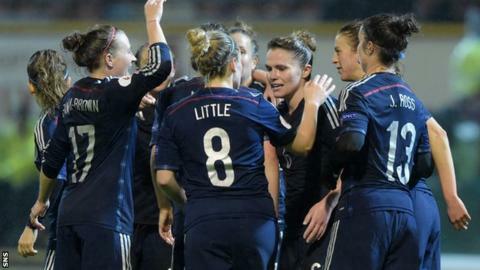 "If you go out and look at girls playing football now, I have been so impressed," Signeul told BBC Scotland. "Not just with the quality, but also the quantity and the interest." Scotland face Macedonia at St Mirren Park on Sunday as they bid to make it four wins out of four in their attempt to qualify for a major finals for the first time. Hibernian will also join Glasgow City in next year's Champions League, giving a huge boost to the Scottish Women's Premier League (SWPL). "I think it's fantastic that little Scotland is now among the 12 countries in Europe that have two teams playing in the Champions League," said the Sweden-born coach. "I think everyone thinks that's quite amazing we have managed to do that. "We have put a lot of emphasis on the best clubs in the Premier League and developed them, but we also have the club development officers that are working with the youth and the pathway. "When I came 10 years ago, 65% of all the clubs were just one team. But then we started to talk about how important it was to have a youth set-up and academies. Everyone has that now. "Three weeks ago, I saw the Hibs set-up with under-nine girls, under-11, under-13, 15, it's fantastic to see. "Glasgow City are doing the same thing, Rangers, Celtic, and now it is maybe 30% of the clubs that are just a one club team." Her counterpart Gordon Strachan recently vowed to help change the structure of the men's game with the national side struggling to qualify for a major finals since the 1998 World Cup in France, while only Celtic remain in Europe and the Scottish champions are bottom of their Europa League group. However, there are contrasting fortunes in the women's game, with Scotland on course to take one of the two qualifying spots for the European Championships in the Netherlands. "It's really changed that everyone has started to take responsibility over the youth," said Signeul. "In 10 years we haven't increased the participation as much as we would like. However, we have probably gone from 2,000 to 8,000 players. "It grows slowly, but what we have done is build more facilities. There's more opportunities for girls to play. "We are building up the base to stand and grow on. "Now that we have that, women's football is going to grow. In 10 years' time, I am sure we will have more than 20,000 players." Signeul, though, hopes that the SWPL will one day match the men's game in terms of being a career path. "We have always learned a lot from men's football," she added. "It's inevitable if we want to develop the game we need to make it professional, we need to get money into the sport."